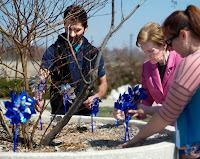 April is National Child Abuse Prevention Month and, this morning, I took part in a lovely ceremony at the Colonnade that was organized by our very own faculty, Betsy Goulet and Donna Weinstein, to raise awareness about this important subject. Did you know it is estimated that at least one in 25 children in Sangamon County is the victim of children abuse each year? We planted blue pinwheels by the colonnade as a reminder to each of us about the importance of working to address this important issue in our community. I know I’ve said it a few times before, but leadership is truly lived at UIS every day.